I grabbed two fairy tale retellings close together recently, and read two very different versions of Sleeping Beauty. 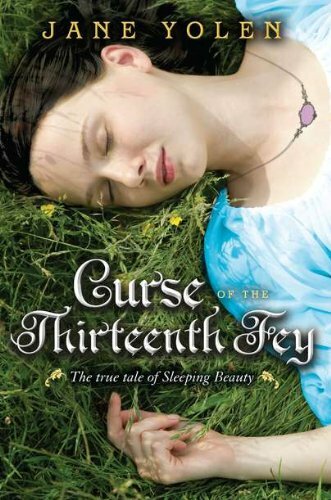 I reviewed Sleeping Beauty’s Daughters last week, and today I’m looking at Curse of the Thirteenth Fey by Jane Yolen. Gorse is the thirteenth fey of the title, the youngest in her large family of Shouting Feys. She grows up in a clannish circle, in an idyllic valley—and even if the folly and belvedere and other buildings the family lives in are a little run-down, Gorse loves her home. But she also loves reading about other places in her father’s library, and is horrified to learn her family is under a Vow to never leave their home. When the king Bids the Shouting Feys to come to his daughter’s christening, thirteen-year-old Gorse sets off late—and meets an accident along the way that traps her with two fairy princes who need her help to escape. I think Jane Yolen is one of those authors people know, right? Wizard’s Hall is what comes to mind for me, but I suspect she’s known for lots of other books too. And that’s one reason I really wish I had liked this more than I did—and I really think I should have liked it more than I did! The problem was the subtitle, describing this as “The True Tale of Sleeping Beauty.” Any story claiming to be the “true” version of any fairy tale can smack a bit of arrogance…but the real trouble here is that most of the story wasn’t about Sleeping Beauty. I liked the first hundred pages or so quite a lot. Yolen set up an interesting world, I enjoyed Gorse and her family, and there was enough mix of world-building and obstacles to keep me engaged. And then we got to the part about the christening, with the delightful additional note that this particular baby princess is known for her unceasing crying. But Gorse gets interrupted en route to the christening, and while her resulting adventure is interesting too…it took far too long for me to realize that this wasn’t a delay or distraction from the main plot, but actually was the main plot. Most of the novel is spent with the two princes belowground, as Gorse figures out their history, and realizes that neither prince was what he seemed to be on first impressions. I liked the character development here, of the princes and of Gorse, as she learns about the limits (and opportunities) of her abilities, and the importance of her own confidence. I think if I had come into this looking for simply a fantasy story, I would have liked all of it just fine. Except…it was supposed to be Sleeping Beauty! And we didn’t even get to the christening until nearly the end of the book. Which left me spending too much time wondering when we were going to get on to what was (theoretically) the main event. I have to cautiously recommend this one. It’s a genuinely good fantasy! It’s just not a very good version of Sleeping Beauty, considering that story became little more than an epilogue. So don’t go in expecting more than that on the fairy tale, and you will probably like this just fine—maybe more than I did! I love Yolen’s Owl Moon, and the Catwings series. I haven’t read much of her work for older readers, but this does strike me as – well, from your description, it sounds almost like it’s the first book in a series, yet it doesn’t seem to be. How odd. I think I’ll give it a pass, and thank you. My all-time favorite Sleeping Beauty retelling has to be Robin McKinley’s Spindle’s End. Anything else seems a little pale in comparison! I do know of Jane Yolen and, in my opinion, she should stick to picture books. I read Wizard’s Hall because of her claim against J.K. Rowling. There were a few things about the books that were similar, but there’s no comparison in any other way other than a few ideas. What J.K. did blew the “weird” Wizard’s Hall story off the planet, in my opinion. I found that whole “quilt” thing so strange and lacking : / Anyway, it doesn’t surprise me to hear you were disappointed with this rendition, Cheryl.